It has taken a whole year - but London mayor Boris Johnson has finally got his own back on Arnold Schwarzenegger. As he was waiting to address last year's Tory conference via video link, the California Governor seemed highly amused by Mr Johnson's speaking style. 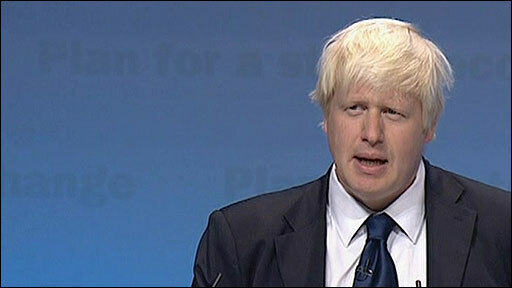 In a a clip which became a hit on YouTube, he can be heard whispering to aides about Mr Johnson "fumbling". But now the London mayor has had the last the laugh, describing "Arnie" as a "monosyllabic Austrian cyborg". He made the quip at the start of his speech to this year's Tory conference - his first to that gathering since he beat Labour's Ken Livingstone to the London mayoral crown. Mr Johnson - always a favourite at Tory conferences - was given a rapturous reception by party representatives in Birmingham. He told them: "Thank you very much for that welcome. Much more generous than in 2006 when I was physically pelted with pork pies by the press corps or last year when my speaking style was criticised by Arnold Schwarzenegger. "And it was a low moment, my friends, to have my speaking style denounced by a monosyllabic Austrian cyborg. "But I can say now to Arnie that in spite of all his doubts and though there was a great deal of suspense until the final reel, Ken Livingstone was terminated." He added that he was not Mr Livingstone's Terminator but the "people in this hall who did it". Mr Johnson also playfully acknowledged Tory leader David Cameron's warning to the party to avoid complacency, saying: "I know this is not time for triumphalism, Dave" before going on to list some of his early achievements as mayor "in a strictly non-triumphalist way". Mr Cameron - said by some pundits to fear a challenge from Mr Johnson for the party leadership at some stage - was seen laughing heartily at the London mayor's jokes, as he sat in the audience.